Quick Reload - hit 'Q' to restart the level instantly - NO LOAD TIMES! Most importantly all your save files are 100% compatible with the update...so please enjoy and BUY our great game NOW and help us pay for all these great and FREE improvements! It should be done by the end of the year and will include some greatly enhanced graphics, a new trophy room, and more. Bytten Gives the Magic Toy Chest a 90%! "There aren't many downsides to TMTC"
"Graphics are high quality and quite cartoony"
"This is a welcome brain-stretching exercise for all TIM fans, and ideal for parents looking to stretch their children - no violence, bright and cheerful, encouraging logical thought... and it might inspire them to tidy their rooms, but I can't promise anything in that direction! Now I'm off to try setting up a domino rally... "
"The skip feature is a great feature and eliminates the frustration factor. 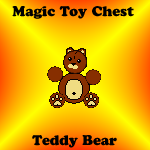 It is a big frustration to have one level stop the player from continuing on with the game"
"The Magic Toychest was a really fun game and had a good balance between challenging puzzles and easier puzzles. The physics in the game are great and the toys and balls roll like you would expect them to when they are hit. 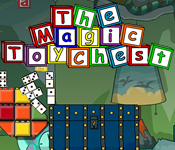 Any player that likes physics games and enjoys puzzles, should definitely check out The Magic Toychest. The game has a lot of game play and is worth the $19.95." The New Demo version has been uploaded. "...Graduate Games has come up with something really special here, and I want to take the time to tell you about it so that hopefully some more retro gaming enthusiasts out there will check it out." "The vibe in The Magic Toy Chest is deceptively cute, and while I'm sure that it would be a great game for the younger set, it also has a whole lot of meat in there for anyone to dig into." "High score junkies are going to find a well balanced, challenging, and thoroughly engaging experience to dig into, and even those that usually aren't into going for high scores will find themselves saying "just one more try..." and getting addicted to perfection." "I give it my highest recommendation, and heavily suggest that everyone that reads this at least pick up the free demo. It's obvious that Graduate Games do what they do purely out of their love of videogaming, and their latest lovechild is a wonderful example of what a couple of creative minds can achieve when they're really passionate about what they do." ".... the game is accessible, intuitive, and unimposing, presenting a colorful world full of amusing toys and an extremely basic premise and goal." "Parents needn’t worry about their kids running this game, nor playing it — nothing even remotely objectionable can be found in The Magic Toy Chest, whose sole plot point is “The house is a mess. Clean it up.”"
"The new ingredients it does add to the formula, though, are all clever enough to interest experienced puzzle gamers." "The Magic Toy Chest is a fun game, it’s true. It’s quick to learn and has a good amount of variety to its puzzles, and its cheerful motif will put a little smile on your face. Parents looking to amuse their young gamer progeny would do well to consider this title." Step 3: Follow the instructions, agree to the license agreement and input your registration key (for full version only). Step 4: When setup is completed you can read the online manual or launch the game. The Magic Toy Chest is HERE! 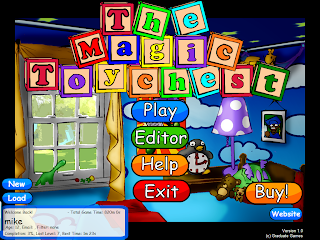 The Magic Toy Chest is available for PURCHASE and DEMO DOWNLOAD NOW! Check it out and support us and our passion for gaming. The Magic Toy Chest is coming August 12th! 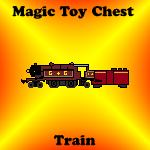 That's right, look for the Magic Toy Chest to be released August 12th and get ready for some crazy puzzle action inspired by games like "The Incredible Machine". The game will release for just under $20. If you want a reminder, tips & tricks, along with other updates about our upcoming games, please take a moment to sign-up for our newsletter. The video above demonstrates the superfluous technique of pausing the game's physics engine. You can pause/unpause physics by hitting spacebar, clicking the play/pause icon in the bottom right, or by clicking the center mouse button (mousewheel). This function is only required to solve 5 of the final puzzles in the game and can make some puzzles easier. It is primarily included because some people prefer to set everything up and then play it out; plus it is a pretty fun function to experiment with. Your actions are tallied as you play a puzzle. You want to try to solve each puzzle in as few actions as possible. What counts as an action? In the example video above, there are 3 actions: placing the dart gun, firing a dart, and launching the rocket. 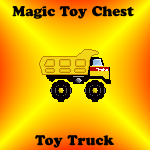 As you play through the Magic Toy Chest, you will learn more about each toy, it's abilities, weight, and shape. 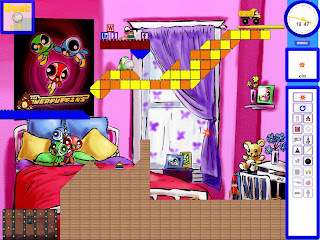 Each level can be solved by correctly building paths, using toys' abilities, or using physics to manipulate toys and objects. Take a look at the video below to get an idea of a puzzle solution. The goal in the video is to get the alphabet blocks into the toy chest. Obviously, a Bowling Ball has a lot of weight to it and will roll. 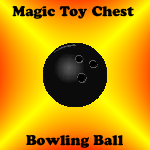 By rolling the bowling ball into the blocks, the blocks tumble into the chest, completing your goal. The final tip I can give you about puzzle solving is to take note of the level description and hint. The Level Hints will usually help get you in the right direction and will highlight the toy that the solution usually revolves around. Make sure to play through all the Tutorial Levels too, since the later levels highlight each toy and how it works. 2. By losing enough of the goal toys, making it impossible to reach your goal. 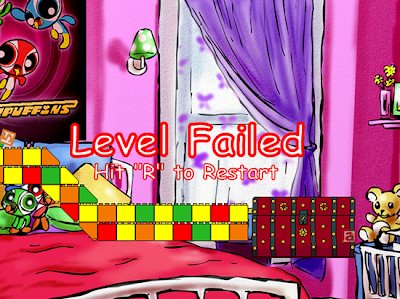 When the Level Failure prompt appears, press the 'R' Key to Restart the level. In many cases, a Player will make mistakes and potentially get their goal toys stuck or use their available tools in an incorrect manner. Unfortunately, the game cannot detect this as Level Failure. If you get stuck for too long, make a mistake, etc. remember that you can press 'R' at any time to restart the Level. Before you can put away any of your toys, the Magic Toy Chest must be opened. Find and click on all the toy chest keys. When there are no more keys, click on the toy chest to open it. If you have missed a key, clicking on the toy chest will do nothing. 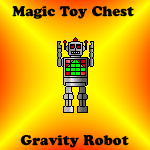 The top of the toy chest can be manipulated by physics, so be wary that the Gravity Robot, Balloons, and or the Dart Gun can remove the toy chest lid. In many cases, this lid can interfere with the chore at hand. 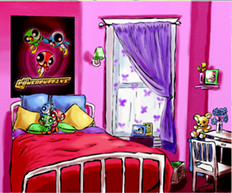 The Goal of each level is to put away a specified amount of a certain toy within the Level's time limit. 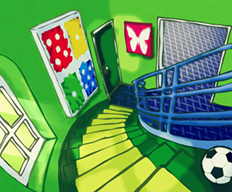 This goal toy is displayed in the upper right corner. The level is completed when the adequate number of goal toys have been returned to the toy chest. 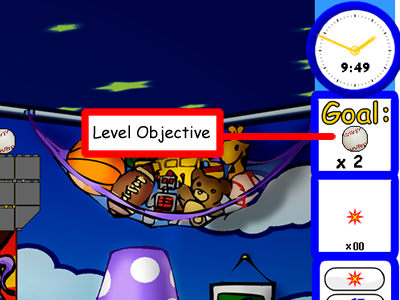 When the goal toys fall into the chest, they will automatically disappear and the goal amount will decrease. When this goal amount reaches Zero, the Chore is complete! Save As Button - Opens a browser window where you can select where to save and what to name your level file. The Level Properties are almost all located at the bottom of the Editor Menu. 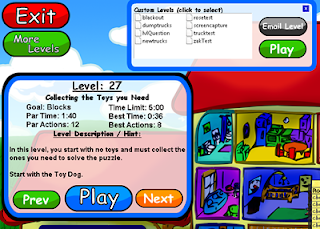 Each Level for the Magic Toy Chest has a Title, Description, Time Lmit, Goal Toy, Goal Amount, Par Time, and Par Action. Setting the Goal - You can adjust the level's goal toy and the goal amount by clicking the +/- buttons at the top of the right menu. It is important to include an adequate number of the goal toy so that the Level can be completed. Level Description - click and type in this area to describe your level, give a hint, or include an author credit. Setting Level Time Limit - left click and hold on either the +/- Buttons to increase and decrease the Level Time Limit. You can right click to incrementally increase/decrease. Setting the Par Time - left click and hold on either the +/- Buttons to increase and decrease the Level Par Time. You can right click to incrementally increase/decrease. Setting the Par Actions- Left click on either the +/- Buttons to increase and decrease the Level Par Time. You can right click and hold to drastically increase/decrease the level's actions. Selecting your Toy/Tool - Your cursor will display the current toy/tool that you have selected. You can left click on any of the tools in the Editor Menu to instantly select them. You can also use the up/down arrow keys to change your current tool. 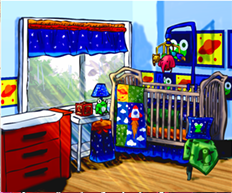 Placing Background Tiles - First select a background tile (the black tiles above the toy chest). Next use the +/- buttons in the right bar to set the tile's texture. Left click on the grid to place your selected tile. You can left click a tile to change the texture. Right clicking a tile will remove it. 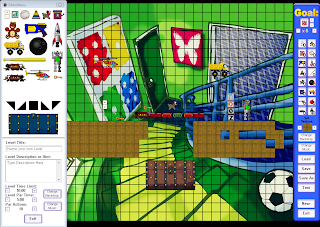 You can press and hold the Left Mouse Button to draw tiles across the grid. 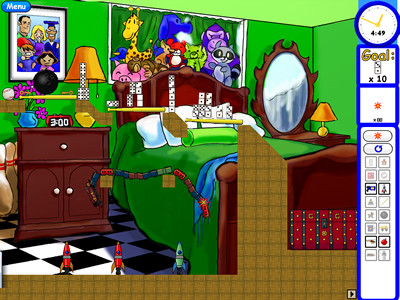 Placing Toys/Toy Chest/Keys - Select a Toy from the Editor Menu and left click to place it in the level exactly where your cursor is displayed. 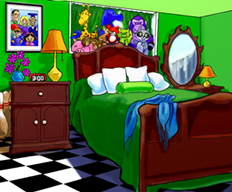 You can change many toys directions by double clicking with the left mouse button on them. To remove a toy, right click on the toy or use the eraser. Erasing - Pressing and holding the right mouse button for a few seconds will change your cursor into an eraser. Touching any object with the eraser will remove it from the field. Releasing the right mouse button will return your cursor to your last used toy/tool. Closing/Opening/Moving the Editor Menu- If the Editor menu is in your way, you can click and drag the window or close it by clicking the x or the close button. To open the Editor menu press Spacebar. It is often helpful to select your tool, close the menu, edit your level and then reopen the menu when you need to change tools or edit lvl properties. 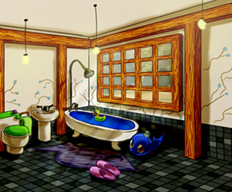 Changing the Backdrop - Left/Right click the Change Backdrop button to cycle through the available rooms/backgrounds for your level. Changing the Music - Left/Right click the Change Music button to cycle through the available music for your level. Gameplay Expained: Menus/Toy Toolbox etc. 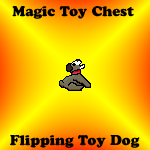 The image above briefly explains many of the menu and game objects in The Magic Toy Chest. Time Left - This counter displays how much time left you have before you exceed the level's time limit and fail the level. Current Toy Selected - This displays the current toy/tool that you have selected. your cursor will also change to the toy you have selected. Selected Toy Inventory - This number reflects how many of the selected toy you have remaining to use. If the action tool is selected, this number reflects the number of actions you have taken in the level so far. Available Toy Button - if you have a certain toy in your inventory the button will become active. 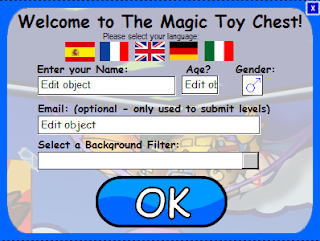 Click an available toy's button to select that toy. Unavailable Toy Button - if you have no inventory of a certain toy, that toy's button will become inactive and unavailable. Physics Pause/Play Indicator - this indicator shows you whether or not you have the game's physics playing or not. You can Toggle the world's physics to play/pause by pressing spacebar or clicking the middle mouse button. This indicator displays the current state. After putting away all of the specified toys, the "Chore Completed" Menu (pictured below) will open and inform you about your level statistics. You can earn 1-3 stars. You will get 1 star for successfully beating the level and you can earn additional stars for beating the level's par time and/or staying below the maximum allotted actions. 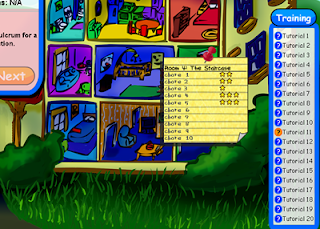 The Menu above displays the current Level's Par Time, Your Time, Par Actions, Your Actions, and Extra Toys. If you successfully perform under the level's par time and max par actions, you will earn an additional star that will be displayed next to your stat. If your actions and/or par time are better than your previous time/actions, you will set a new record. Only your best times and actions are saved in your profile. When you are ready, you can click either the "Restart" or "Next" Buttons. The "Restart" button will reload the level so you can easily go for those 3 stars and that 100% completion rating. The "Next" Button will load the next level or tutorial. 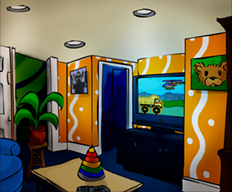 If you are playing the final level of a room, the Next button will return you to the level select screen. In many cases, you can simply use the "Next" and "Prev" Buttons to select the level/chore you would like to play. These buttons increase and decrease the selected level. However, in many cases you will want to select a specific room and chore in the house. The first step is to left click on an unlocked room of the house (locked rooms are blacked out). 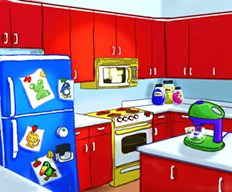 This note will identify the room and will list the 10 chores (or levels). The stars indicate the chores completion. 1 star indicates that you beat the level, 2 stars indicate that you beat the level and were either beat par time or were under the par actions, 3 stars indicate that you have beaten the level 100% and have beaten the par time and par actions. To select a specific chore, click the "chore #" text or line on the notepad. 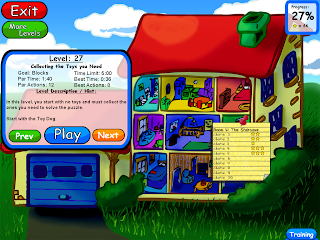 The selected level's title, level number, goal toy, par time, time limit, level hint, etc. will be displayed in the window to the left of the house (displayed above). 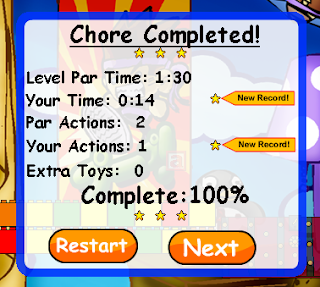 If you have already played the level, it will display your best time and lowest total actions. You can adjust the selected level by clicking the next/prev buttons. When you are ready to play the level. Click the "Play Button"
Click the "More Levels" Button to open the user created level browser. This will open the custom level menu seen in the screenshot above. This menu will list all of the level files that you have created or downloaded (must be in the \Levels\ folder). To play a downloaded or user-created level, simply left click on the desired filename. The level information will be displayed in the level information menu on the left hand side of the screen. 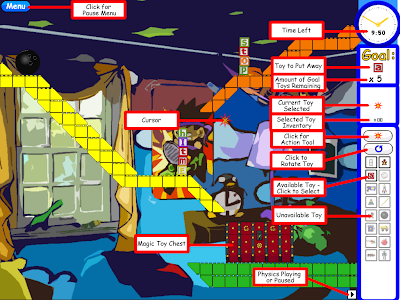 With a level selected left click the "Play" button to load and enjoy the level. If you would like to submit your created level to this website. Select the filename and then click the email level button. This will submit your created level to us for posting on this site. You can click the x box at the top of the custom levels menu to close the menu at any time. The Load Screen reiterates the level title, par time, par actions, hints, etc. while the game loads the level. You can opt to click the "map" button to return to the Level Select Screen or click the "skip" button to move onto the next chore. 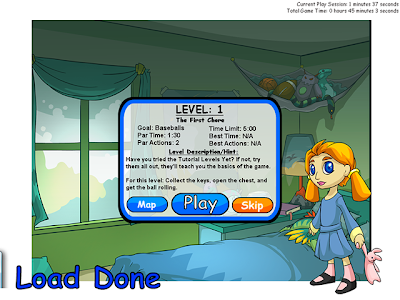 When the level is loaded, the Play button will be enabled and the text will read "Load Done" at the bottom. Click the "Play" Button to begin the level. If it is your first time playing, it is highly recommended that you take some time to play the tutorials. You can open the Tutorial Select Screen by clicking the "Training" button in the bottom-right corner of the Level Select Screen. This will open the select screen pictured above. Select a Tutorial by left clicking the corresponding question mark button. This will load the level information into the level description box (on the left hand side of the screen). Feel free to read about each tutorial. When you are ready and have the correct training level selected, click the "Play" button. Double-clicking a question mark will select and load that tutorial level. The Options Menu can be accessed during Gameplay to change your current play settings. Use the drop down menus to change the music that is playing, change the background/room, change the background filter, or change your language. When you are finished adjusting these options, click the OK button to go back to the gameplay. Pressing ESC or clicking the 'Menu' Button during a level will open the Pause Menu. 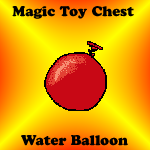 Water Balloons are the Magic Toy Chest's Grenades. With the Water Balloon Toy selected, simply aim and click where you want to throw a water balloon. The balloon will burst open and send any toys or objects in the splash zone flying. The Gravity Robot is one of the wackiest toys in the game. You can place the robot in any direction. Clicking on a Robot will activate its crazy sci-fi gravity powers. Gravity will change in the direction of the Robot's arms and arrow on its chest. Clicking a robot again will put its arms down and restore gravity to normal. Toy Chest Beta 2 is Available for Download! Graduate Games is happy to announce that you can download our second (and probably final) beta starting today (7/7/08-7/14/08). The game has changed quite a bit since the last beta and hopefully everyone who has played the game before will notice the improvements. What has changed since last time? 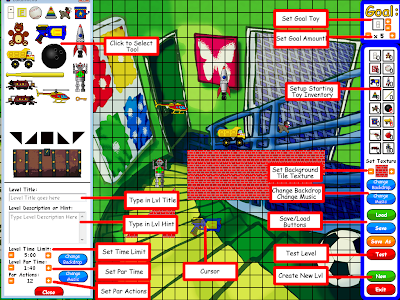 Well there's now 20 Tutorial Levels that will teach you how to play and how all 16 toys work. There's also background filters for everyone that found the backgrounds too "loud." There's also a number of tweaks that make the easier tonavigate, etc and nicer on the eyes. Thank you to everyone who submitted feedback and helped us make these changes. Keep the changes and levels coming and you'll receive $5 off the final game...just make sure we have your email address. Remember to sign-up for our newsletter so you'll know when the game is released. The toy train is a dynamic toy that can be lengthened to create long lines of traincars. You can also pick up individual traincars and break apart the long chain of traincars. With the Train Tool selected, moving the mouse wheel up will add train cars and moving the wheel down will subtract cars. Left clicking will place your entire train into the playfield. The Helicopter is a very sophisticated Toy and is great for transporting other toys to higher heights. Clicking it with the action tool will cause it to hover skywards and then travel forwards in the direction it is facing. 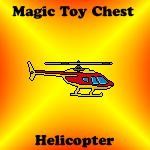 You can also attach any toy to the helicopter by Left Clicking the copter (with any tool selected other than the action tool) holding the left button and dragging it over another toy in the playfield and releasing the left button.... so left click on the copter and drag to another toy. The Toy Truck is a large toy that rolls methodically down inclines. It is very sensitive to gaps and other bumps along the way. By clicking the toy truck, you will engage its front wheel drive and it will move in the direction it is facing for a few seconds. The Jack-in-the-Box acts as a spring. Any toy that collides with it will be launched skywards. The Jack in Box also does not have gravity associated (so it will stay exactly where you place it) and cannot be picked up. The bowling ball is the heaviest object in the game. When you want to knock something around, this rolling behemoth is the toy to use. 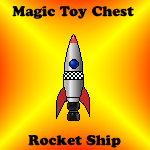 Download and play the beta version of the Magic Toy Chest. Submit custom made levels or send in feedback and you'll receive a $5 off coupon when the game is finally released. Submitting your level will also make your level eligible to be selected for inclusion in the final full version of the game. The Backflipping Toy Dog is a small but heavy toy. The Dog's ability is pretty self expanatory in that it backflips when activated (left clicked w/ the action tool selected). The dog can backflip as many times as you want, but really only works if it is on its feet. 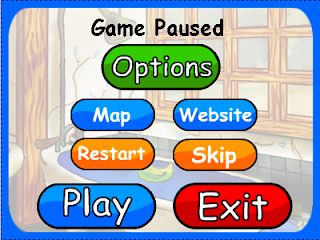 Click the "Load" Button from the title screen to open the Load game menu (pictured above). 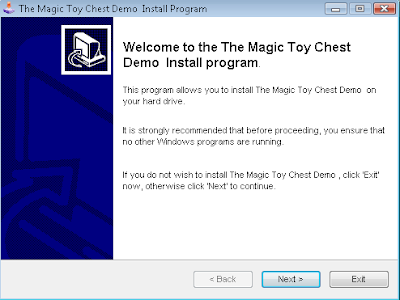 The Magic Toy Chest automatically loads the last profile used to play the game. You will only need to load a profile if you need to switch to a profile other than the last one played. The list will populate itself with all of the saved profiles on your machine. Click a profile to select it and view the saved profile data. With a profile selected, you can rename it, delete it or load it - just click the corresponding buttons. If you have a save file that you have downloaded, emailed, or copied over from another computer, you will have to use the "import" function. Place the save file in the toy chest directory and make a note of the filename. Correctly typing the filename into the field and clicking the import button will add that savefile to the list of saved profiles. 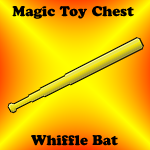 The Whiffle Bat is a long and relatively light toy. It is create for building bridges, ramps and other tall structures. Creating a New Game File is very simple. When the game starts for the first time, it will open the New Game Window. 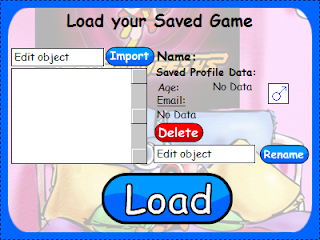 Your game profile contains all of your saved game information along with your name, language, age, gender, email address, and the desired background filter. Clicking a Flag will change the game's language. 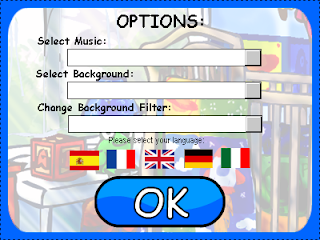 By default, English is selected, but the game features: Spanish, French, German and Italian Languages. Simply click each box and type in your information or select it from a dropdown menu. 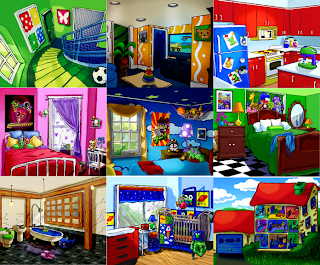 Your gender (click symbol to change) whether your kid character is male/female and will determine which room you start in. Your email address is optional and not required to play the game. If you include your email address, you will be able to submit your created levels to Graduate Games within the game. If you leave your enter text that is not a valid email address, level submissions will fail. Background filter is an optional feature that will help users differentiate the background from the foreground. You can select to Blur the background, simplify it (reduce brightness and detail), or make it look like an antique photo. By default the backgrounds are left alone. When you have finished inputting all your information, click Ok to save and create your profile. The Magic Toy Chest has an autosave feature so all of your completed levels, statistics, and progress will be automatically saved. *Remember that creating a new profile with the exact same name as one already on your computer may overwrite it. i.e. If there is a profile named John...creating a new profile named John may erase or merge the data. 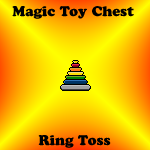 The Ring Toss is a triangular shaped toy. It is great for serving as the fulcrum of a lever or as a reversal point for a rolling baseball. It can also be used as a ramp and incline. The Rocket Ship blasts off with the click of a button. Left Click the Rocket with the action tool selected and watch it lift off in the direction the nose is facing. Use it to get to new heights or knock other things over! The Dart Gun is the first toy you'll come across that has an action associated with it. The Dart Gun is static, so you can place it exactly where you want it to stay and not worry about gravity pulling it down. Darts are affected by gravity and will drift low, so aim high! 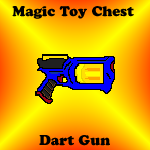 To fire a dart, select the action button (the fat button above all the toy buttons) and left click the gun. Play - When a profile is selected or autoloaded the Play button will be enabled. Click the Play Button to proceed to the level select screen. Editor - This loads the level editor which allows you to create custom levels/puzzles of your own. Help - Opens a browser window and loads up this very manual you're reading. Exit - Pretty self explanatory - click this to close down and exit the game. 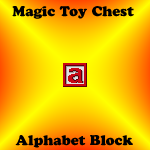 The Alphabet Block is the standard building block of the Magic Toy Chest. These square shaped blocks are great for stacking or getting a ball rolling. Not really that exciting though...just a toy block. The Teddy Bear is a fairly heavy object. It has rag doll physics and is very fun to play with visually. It is a rather hard object to get into the toy chest because of its shape, size, and weight. It is one of the best objects to use to knock over things (such as a rocket or block tower) and is also useful as a lighter substitute to the bowling ball. 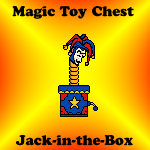 In many cases, the first step in every level should be to open the magic toy chest. 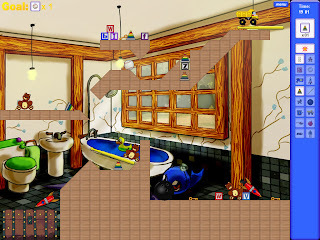 The toy chest can only be opened by collecting all the keys in the level or using the physics and gameplay mechanics to move the toy chest's lid. To collect a key, simply left click it. 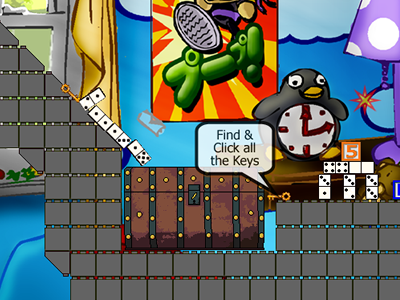 When there are no more keys left in the level, you will be able to open the toy chest by left clicking on it as well. In later levels, there are sometimes a ton of keys to collect. Remember that the toy lid can easily be shot off with a dart gun, or altered with gravity instead. 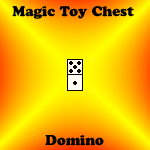 The domino is a basic rectangular shaped toy. The domino is the lightest and smallest toy as well, thus making it the building block of many of the levels. The domino can be rotated using the arrow keys and can be oriented vertically or horizontally. 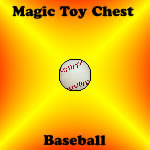 The Baseball is one of the more simplistic toys in the Magic Toy Chest. It is circular / spherical in shape and is very easily rolled. It has a decent weight, but it's shape prevents anything from being stacked effectively on top of it. The baseball is a very popular "goal" in the game. The best way to get it to start rolling is by dropping a block on one of its sides (the higher the better).